Greetings! I am so glad it's Friday! This week has been a hectic one! I had wanted to go to a local food festival this weekend, but my Erin Condren planner is scheduled to be delivered tomorrow! I have a feeling that I'm going to spend the weekend decorating it! I can't wait!! 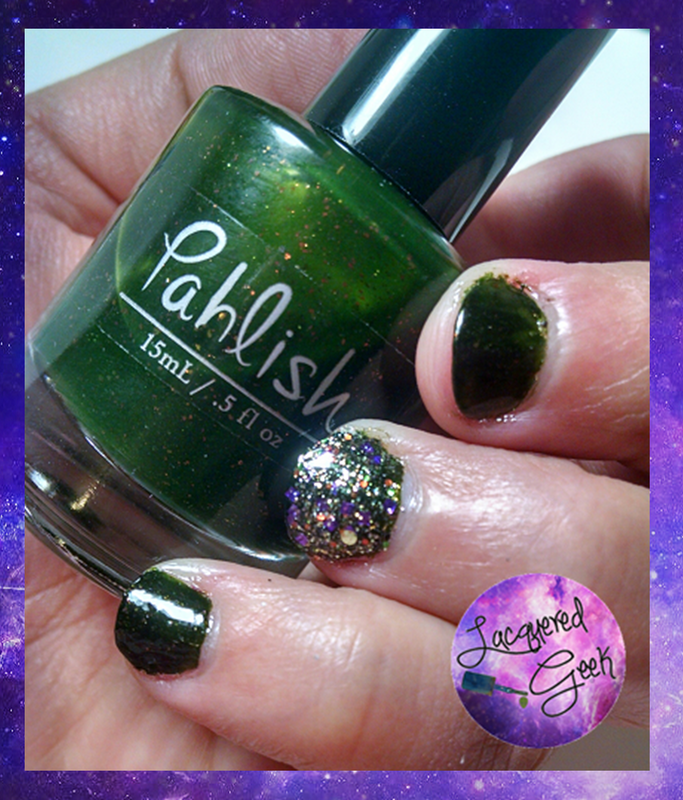 But before tomorrow, we've got to get through today, and I'm going to show you the October 2013 duo from Pahlish! It's no secret that I have accumulated quite the stash of polishes since getting into nail polish. Couple that with being terrible at decision making, and you can imagine what it's like to try to pick what color to paint my nails! There have been times that I just sit and stare at my nail polish swatch sticks as if I'm waiting for one to jump and say "Pick me, pick me!" He ended up picking "Tom Fury" from Pahlish. Tom Fury was the base polish in The Dark Carnival Duo from October 2013. This duo was inspired by "Something Wicked This Way Comes" by Ray Bradbury. 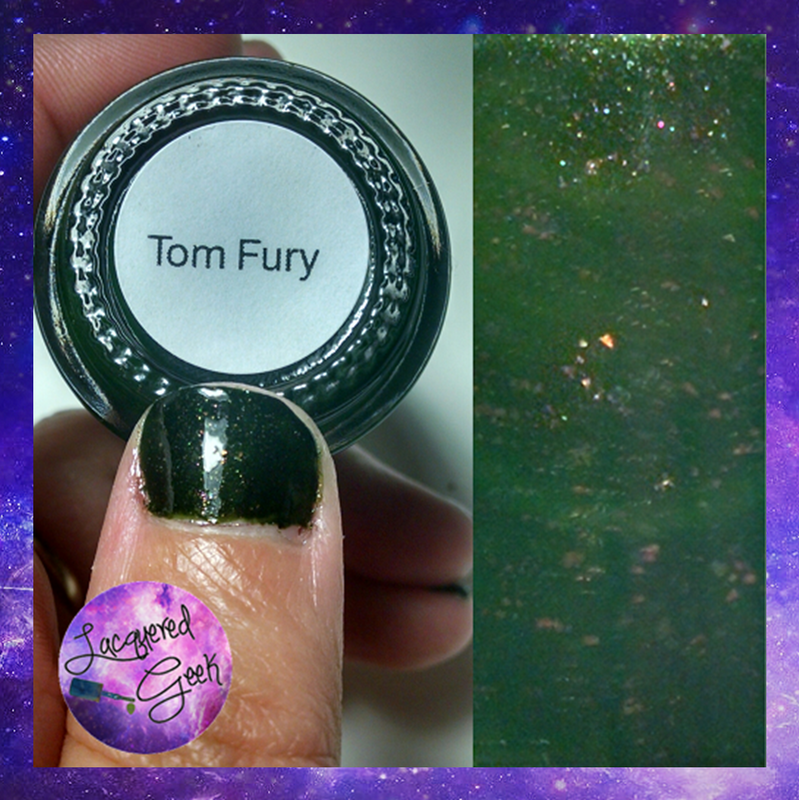 Tom Fury is a "dark olive jelly with a mix of red, charcoal and taupe shimmering flakes." It's one of those polishes that looks almost black in most light. I can see hints of green, and the shimmer is fantastic. In the photos, I am wearing 2 thin coats. The first coat was quite sheer, but the 2nd evened every out nicely. The polish dries matte, so you'll need to use a top coat to get it shiny. 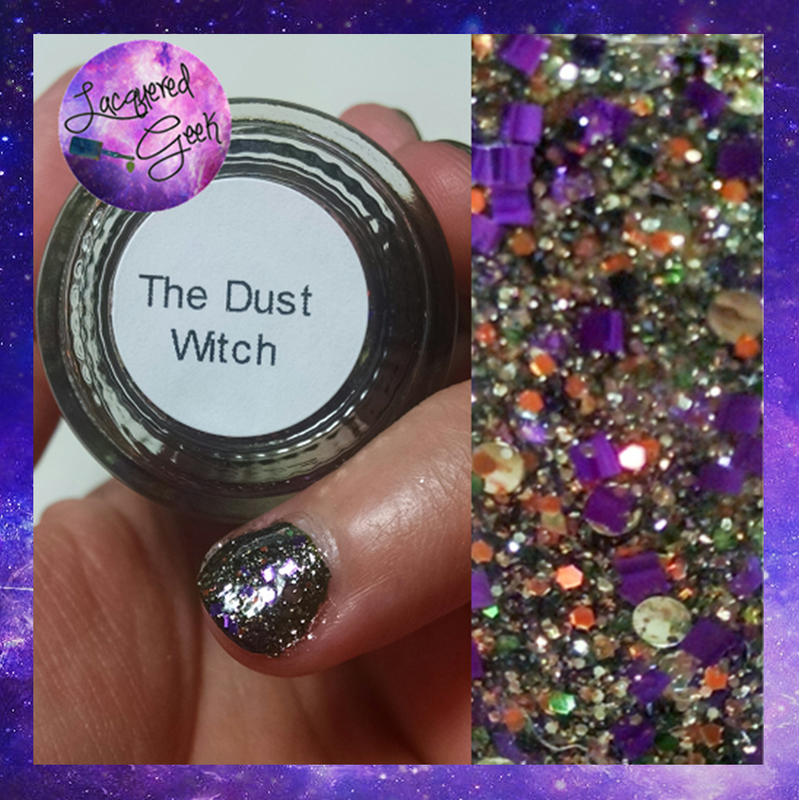 Since he picked part of a duo, I had to use the accompanying glitter topper - "The Dust Witch"! This polish is amazing - so absolutely perfect for fall! It's packed full of gold, orange, and purple glitters. The purple glitters do have a reflective curl to them in the bottle, but rest assured - there is no curling on the nail at all. I think that The Dust Witch's color combination really lends itself to be used in conjunction with lots of different colors. I have a feeling I'll be using it a lot this fall! These polishes were from last year's monthly duo, so they are not available on Pahlish's site. However I have seen them on a few destash sales, so keep an eye out for them. Even though you can't get this particular duo, you can get this year's October duo! Pahlish is launching the October 2014 duo, along with the Happy Holo-ween collection at 7:00PM CST tonight! Judging from the sneak peeks that I've seen so far, this collection is going to amazing!